After several years of mild winters, we can now say that we actually suffered through a long, cold, and sort of snowy one. 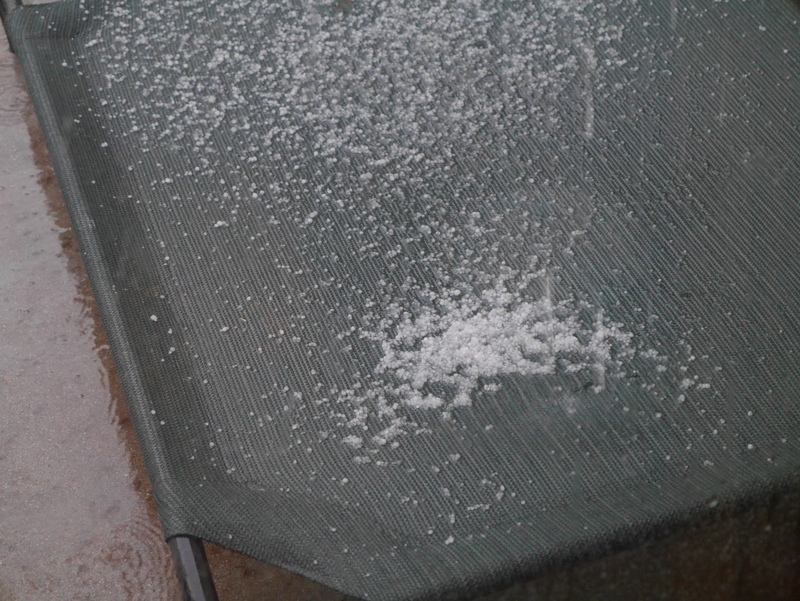 Okay, it was ten minutes of hail but it stayed on the ground for fifteen minutes so that counts, right? We toughed it out, however, and didn’t call for snow plows . . . probably, as I’m pretty sure we don’t have any snow plows in our part of California! Nevertheless, I have pictorial proof of the snowy struggles we endured last week. If you can’t see the layer of snow (okay, hail, whatever!) on the top of the fence, you are just not cooperating! The white stuff (okay, okay, it was hail!) layered itself all over our dogs’ bed . . . sort of. Glad I took pictures because not one person from the eastern side of the country seemed to be worried about this event in California!